Today is the big day. 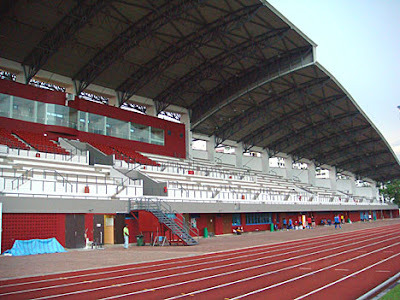 At 7.30pm tonight Phnom Penh Crown will take to the field against one of Singapore's strongest clubs. 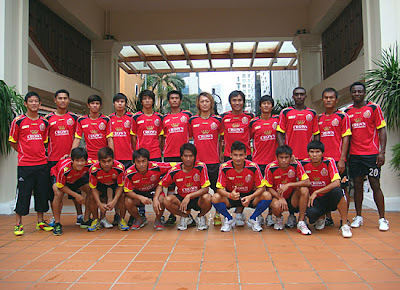 Between 2006-2009 the Singapore Armed Forces team carried all before them with 4 consecutive S-League championship titles. Last year they wavered a little and finished 4th but are again challenging for honours this season. 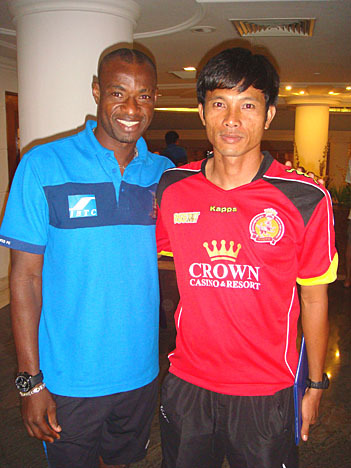 Tonight they meet the best team in Cambodia. A 2-legged quarter-final tie against Albirex Niigata awaits the winners. Tonight's match is a one-off, winner takes all encounter. The Crown team arrived in Singapore yesterday afternoon. After last night's training session on the SAFFC pitch, the players had a light warming up session this morning at 8am, in front of their hotel. A few stretches and a jog just to get themselves ready for tonight's exertions. The team have free time now until a pre-lunch team meeting to discuss tactics. After lunch, more rest until high-tea and then off to the ground a couple of hours before the game. Everyone is in very good spirits, they know how good the opposition are but they also know how well they can play when they're on top of their game as we saw in the recent President's Cup matches. That's the sort of standard they'll need to match to get anything from tonight's game. We're in Singapore but the internet access at the hotel is appalling. Hence the delay in getting online and the limited time I have available. It's taken me 45 minutes just to get access to type this drivel. We flew from Phnom Penh after lunch on one of the cheap airlines. Then picked up at Changi Airport and whisked off to our hotel, the Albert Court Village Hotel where a late buffet lunch was waiting. There was little time to rest as the players and officials boarded the bus again for the 35 minute ride to the Armed Forces Stadium at Choa Chu Kang for a training session on the pitch and under floodlights. The pitch is flat, though the ground is open-sided on three sides, with a pretty imposing stand on one side. There's a large running track around the pitch. The players ended their session with some penalty kicks as the match tomorrow will go to 90 minutes, then extra time and then penalties if necessary. 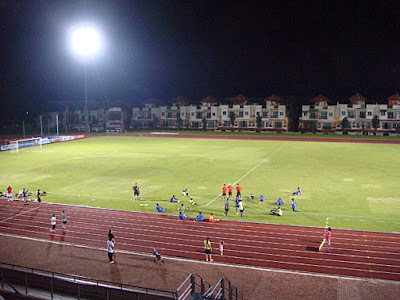 On our return to the hotel, and after a late dinner, the players had to formally register with the Singapore FA and each player had to undergo facial recognition from the FA official before they tootled off to bed and we continued with a manager's team meeting to iron out the finer points for tomorrow. Takahito Ota arrived as we finished, he was held up in Phnom Penh awaiting his Cambodian visa, and as we were chatting with Jean Roger Lappe Lappe, the former Crown striker who was staying in the same hotel as us with his current team, Okkthar United from Myanmar. The players will be up and out for a run at 8am tomorrow morning. Footnote: We've just heard that Chinese Taipei will get the finals of the AFC President's Cup in September. PPCFC had indicated their interest in hosting the finals but the AFC awarded them to the former Taiwan yesterday. The Crown players take a breather under the lights. The houses on the far side sell for in excess of $1million.